Salt-Glaze is an unusual ceramic process whereby the outside of a clay pot is melted into a glaze by salt at very high temperatures. This is achieved by throwing common salt (NaCl) on to the flames at top temperature (1320°C) where it vaporises and reactive Sodium (Na) is released to dissolve the highly siliceous (SiO2) stoneware clay into a soda glass (glaze) on the pots. Unfortunately it also dissolves the kiln and shelves! This technique leads to the dramatic surface textures so characteristic of salt-glaze; from coarse orange peel on a sanded body to the subtle lustre on a smooth clay body. 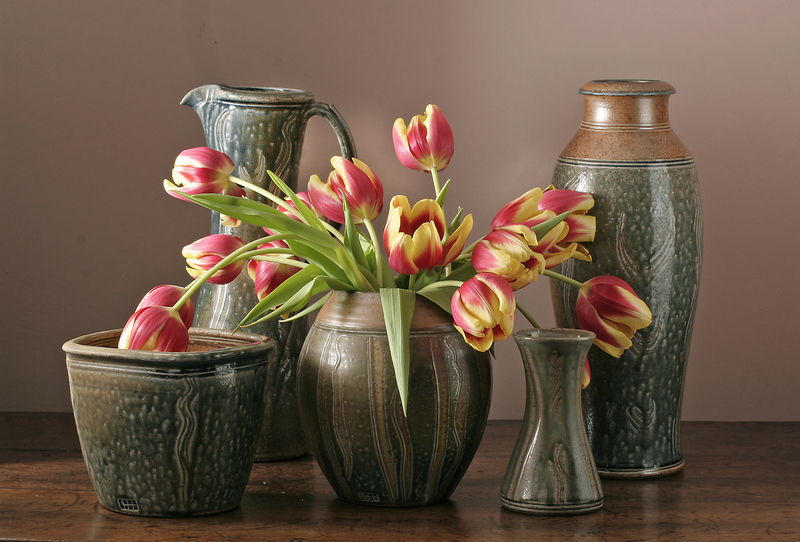 Salt-glaze stoneware was first introduced, from the Rhine Basin, in the 16th Century. It was the first thin, durable and corrosion resistant pottery to be made in Europe. Huge quantities of flaggons, jugs and mugs were imported over the next 100 years, including the famous 'Greybeards' or 'Bellarmines'. 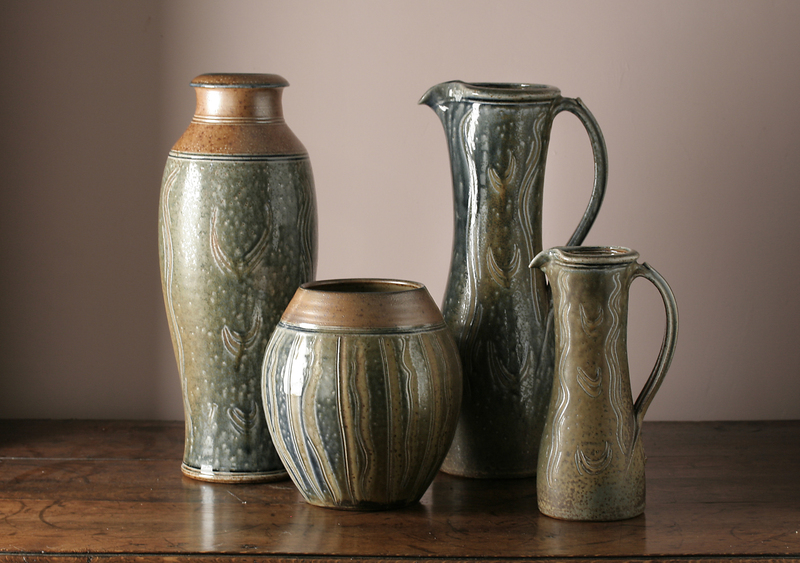 By 1671 John Dwight succeeded in producing brown salt-glazed stonewares at Fulham and the technique quickly spread. The introduction of white clays from Devon and Dorset in 1720 saw the development of a white-body salt-glaze on which they attempted painted decoration in imitation of the superior Chinese porcelains. The invention in 1770 of a low temperature creamware body with a smooth lead glaze which readily accepted painted decoration not only set the future for English tableware but sounded the death knell of salt-glaze's pre-eminence. Salt-glaze was henceforth relegated to the likes of wine flaggons, ginger beer bottles, ink wells and sewage pipes. Indeed it was the salt-glaze sewage pipe that ultimately made Salt-glaze a great benefactor of mankind; for it was piped water and sewerage that was primarily responsible for the eradication of cholera and typhoid and the cleaning up of our cities. Thus salt-glaze was pivotal in the development of mankind..!!! For further information regarding the commission of bespoke ceramics, or indeed any other enquiry, please contact Toff using the details below or complete the form.